People rarely pick a fight with Dirty Harry. But Chrysler’s “Halftime in America” ad featuring quintessential tough guy Clint Eastwood has generated fierce debate about whether it accurately portrays the country’s most economically distressed city or amounts to a campaign ad for President Barack Obama and the auto bailouts. The 2-minute ad holds up Detroit as a model for American recovery while idealistic images of families, middle class workers and factories scroll across the screen. Conservatives, including GOP strategist Karl Rove, criticized the ad as a not-so-thinly veiled endorsement of the federal government’s auto industry bailouts. Others questioned basing a story of economic resurgence in a city that remains in fiscal disarray, with a $200 million budget deficit and cash flow concerns that have it fending off a state takeover. But is it political? That depends on who you ask. 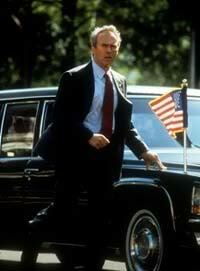 Clint Eastwood being a hollywood presidential foot soldier for Obama second term campaign. This entry was posted on February 7, 2012 at 5:37 am and is filed under Uncategorized. You can follow any responses to this entry through the RSS 2.0 feed. You can leave a response, or trackback from your own site.